After suffering a broken heart and barely escaping the hangman, Jack Harding escapes his past by becoming the head of a private army and spending his leisure moments as a Devil's Disciple, a group of rakes who model themselves on the old Hellfire Club. But, to his surprise, he discovers that beneath the cold steel of a mercenary lurks the heart of a knight errant. When he meets a young woman from Quebec, alone at an inn on the road to London, he is enchanted, and shocked to find the young Canadian not eager to play by the rules of the Devil's Disciples. Victoire du Bois, daughter of a Canadian woodsman and granddaughter of an exiled English nobleman, has come to live with her lofty-titled relatives in England. But when they fail to meet her in Plymouth, she begins to wonder if they truly welcome the arrival of the young woman who is destined to inherit a large trust fund they might wish to keep in the immediate family. A series of attempts on her life confirm her doubts, leaving Victoire with nowhere to turn but to the rake she nearly shot at an inn on the road from Plymouth. 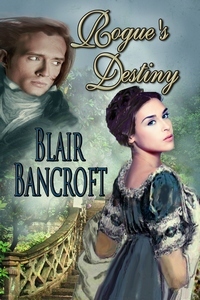 Warning: Although the story in Rogue's Destiny stands alone, it contains major spoilers for the previous books in the Regency Warrior series: The Sometime Bride, Tarleton's Wife, and O'Rourke's Heiress.